Please write “KAINI LI” on the check memo line or in the memo or account field in your online bill payer. Connie came to Christ in her sophomore year at college in China, where she had spent a year going to Bible study and attending family church before she decided to become a follower. God revealed Himself to her by His wise and gentle words, as well as numerous experiences when she was completely overwhelmed by His love, mercy, and grace. She is very grateful that God redeemed and restored her and her family. 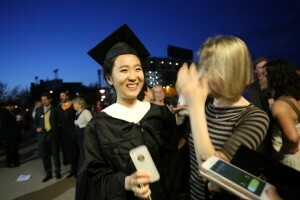 After graduating, she came to U.S. for a master’s in international affairs at Pennsylvania State University in 2012, where she got deeply involved in international students’ activities and mission trips. When she served as the student vice president of the International Christian Fellowship at Penn State, she discovered her passion in working with international campus ministry team. In working with international students, she sees every challenge as an invitation from God to be open-minded and to make the gospel known to all nations. She likes to learn their culture, thoughts, and experiences to enrich her understanding of how people from different backgrounds respond differently to the same message and same situation, revealing how great is our God, who creates all these uniquely different minds! While she worked as a youth camp counselor at Camp Krislund in Pennsylvania for the summer 2013, she learned to take care of others rather than focusing on herself because she was responsible for leading 10 to 20 campers each week, feeding them, giving them medicine on time, taking them to every outdoor activity, leading Bible studies, and playing music in worship services, as well as coping with emergencies on a daily basis. God molded her through trials and difficulties to help her grow in patience, perseverance, trust, sobermindedness, and courage, as she was pushed to the very end of her limits. In the summer 2014, she did an internship in international development and cultural exchange in South Africa. Working with the international community reminded her that sacrificially serving others, regardless of boundaries, requires action more than words and is a good opportunity to live out her faith. God equipped her to do campus ministry through all these cross-cultural experiences. She heard God’s call to international ministry during her master’s program in international affairs with research focus on international culture exchange and behavioral economics. God shaped her heart for international students through multiple international conferences, retreats, and multinational life groups where she realized what “love conquers all” means.